CRIMEAN CANNONS - WHERE ARE THEY NOW? 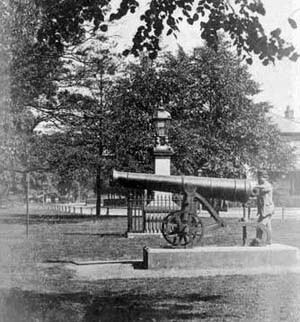 In 1857 a gun from the Crimea War arrived in Leamington. The Gardens Committee, of which Lord Somerville was a participant, had requested such a souvenir of war from the Secretary for War. The Cannon, which had been captured at Sebastopol, was duly located in the Jephson Gardens. The Local Board of Health however laid similar claim to it and after a minor skirmish the Cannon was re-sited in Holly Walk. Here it remained until removed for war scrap in World War II. Pictures - The Russian Cannon in Holly Walk, Leamington Spa 1870 and 1861. George Morley records the arrival of the Leamington Cannon in his "History of Royal Leamington Spa" published in the Courier 1887-9 (ch.XXV). Lord Panmure, well known in Leamington at the time, presented the town with their Crimea Cannon in July 1857. The town was to provide a suitable gun carriage for it, which it subsequently did at a cost of thirty pounds based on authentic designs supplied by the War Office. 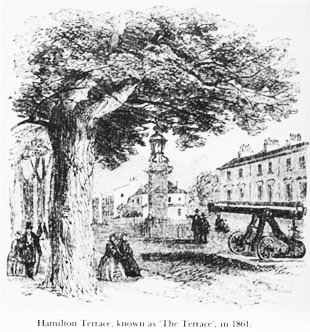 The Cannon was placed in Holly Walk in front of Hamilton Terrace. Its original location was Jephson Gardens but, according to Morley, was relocated to a more public place at the request of Lord Panmure. The gun was presented in recognition of the prowess of Major-General Wyndham, a local resident, who captured an identical gun from the Muscovites.